Food fraud rarely makes the news. The last major one was the 2013 horsemeat scandal. Goods prone to substitution also include olive oil and coffee. Currently, only a handful of companies are prosecuted each year. Typically, fraudsters mislabel cheap products as premium – such as horse meat for beef – or pad out a pure product with a cheaper alternative. Fish, grains, honey, coffee, tea, spices, wine, certain fruit juices, milk and meat are the mostly commonly subject to fraud, according to a list drawn up by the EU Committee on the Environment, Public Health and Food Safety. Another common substitution is expensive organic food being replaced by cheaper non-organic ingredients. The National Food Crime Unit is the Food Standards Agency (FSA)’s criminal investigation unit. Sian Edmunds, a partner at law firm Burges-Salmon, who specialises in food and drink regulation, told the BBC: “There are potentially very serious safety issues. “I had a case recently involving the supplier of a pesto product. Pesto is normally made with pine nuts but in this product the pine-nuts had been replaced with peanuts, which is a cheaper product but of course is one of the major allergens. Chris Elliott, professor of food safety at Queen’s University Belfast and the founder of the Institute for Global Food Security, says that he sees “probably two, certainly less than five” prosecutions for food fraud reported in the UK each year. While the risk to health is the most serious issue, there are also significant financial costs associated with food fraud. 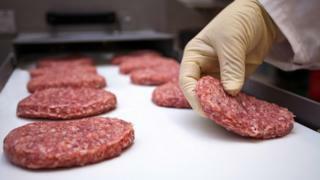 Research carried out last year by NFU Mutual suggested that it costs the UK food and drink industry up to £12bn a year. That is partly due to overpayments for lesser ingredients, but also reflects the impact of unfair competition and the reputational damage when firms are revealed to have been unwitting participants in food fraud. For consumers, there is good and bad news. Prof Elliott led the government review into food fraud after the horsemeat scandal and says that supermarkets have vastly improved their supply chains. However, he added that food chains were now so complicated that a jar of pesto in a supermarket could have had 40 or 50 different businesses involved in its production and distribution.